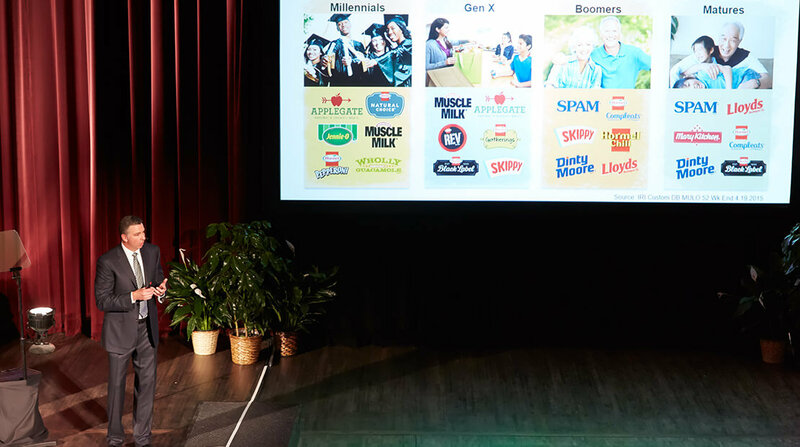 During its annual shareholder meeting in Austin, Minn., Hormel Foods Corporation (NYSE: HRL) celebrated a record fiscal year in 2015, and highlighted the company’s Refrigerated Foods segment. Adjusted net earnings exclude charges relating to the closure of the Stockton, California, manufacturing facility, the exit from international joint venture businesses, the goodwill impairment charge associated with the Diamond Crystal Brands business and an adjustment to the contingent consideration accrual for CytoSport in fiscal 2015. The tables below show the calculations to reconcile from the non-GAAP adjusted measures to the GAAP measures for the full year. Hormel Foods Corporation First Quarter Earnings Release and CAGNY Conference Webcast Hormel Foods announced today that it will issue its earnings press release before the markets open on Tuesday, February 16, 2016. Jaime King plants a tender kiss on son James as she gets into the Halloween spirit early with a feast at her Beverly Hills home Jaime King invited friends and family to a feast at her Beverly Hills home to kick off the holiday season. The soiree was sponsored by Hormel Foods.